by Geoff Pillinger Peter Hall and Mike Curling. The following list contains the names of Players who had appeared in the Bath colours at some time, and lost their lives as a result of First World War service. The names were accumulated while scanning through daily pages at the Bath Chronicle Archives or on information provided by relatives. We wish to apologise to any descendants( if any) of players who may have currently been omitted. Sergeant Alf Cleall killed at the Front 17th February 1915 aged forty. He was a Vice Chairman of the Club. Rifleman Tom West lost in action 29th September 1915. A former Oldfield Park Club centre, he played for Bath and Somerset. He subsequently played for Northern Union Club Rochdale Hornets. Private E (Eddie) L Clarke lost in action 8th July 1916. Another Oldfield Park player, who played for Bath ‘A’s, with appearances for the 1st XV. He had emigrated to Canada and returned with a Canadian Contingent. Sergt. Arthur Douglas West posted missing, presumed dead 13th-15th November 1916. Had joined Northern Union Club Oldham. Lt. Commander G N Biggs. On 9th December 1916, the Bath Chronicle announced that he had been lost at sea. Played one game 1904-5 season. Lt. Colonel G A Perreau. A Bath Chronicle on 24th March 1917 reported the death of Lt. Colonel G A Perreau of the Indian Infantry, killed in Mesopotamia aged 43. A former Hermitage School pupil and player, heappeared for Bath 1891-95, and in Old Crocks XV 1900-01 Season. Private Louis Hatherill. Bath Chronicle on 12th January 1918 – reported Private Louis Hatherill as missing in action. It subsequently transpired that he had been killed. He was an immediate pre-war player. Walter Fletcher died in London Military Camp aged 41. He had been invalided home with shell shock. Chronicle Report on 25th May 1918. D (Dave) Fisher, a Bath stalwart immediately pre-war. He was wounded in France, and died in the Isle of Wight, where he was working on munitions. Lord Alexander Thynne. Bath Chronicle on 17th September 1918 – Lord Alexander Thynne fell in action in command of a Wiltshire Battalion. He was a Vice President of the Bath Football Club. This page was added on 17/05/2015. Alf (Alfred Ernest) Cleall was my great-great uncle and I’ve been researching his life. What follows is a short summary of what I’ve discovered so far. Alf was born on 27 December 1873 in Leominster and was eventually to have four brothers and five sisters. His father had been declared bankrupt in 1869 and had died in 1876 at the early age of 36. The family then moved to Bath and, by 1891, Alf was training as a lithographer’s apprentice. With his brother Wilfred, Alf joined the army and, from 1893 to 1902, both men served in the Dorsetshire Regiment in the UK, in India and in South Africa. Back in Bath after the Boer War, Wilfred was landlord of The Rising Sun inn, at 3-4 Grove Street, in 1902-03 and, in 1903-14, Alf held the licence for The Full Moon hotel, at 13-14 Upper Borough Walls. Wilfred also managed a billiard saloon, formerly known as Beaupin’s, at 9-10 Northumberland Place. Alf was a keen sportsman. He played rugby for Bath Rugby Football Club and ultimately became Vice-Chairman of the club. He also played for Bath Thursday Association Football Club and for the Bath second XI cricket team. Alf married Winifred Marshman in December 1911, and the couple had a daughter, Evelyn, born in December 1912. In 1906, Alf joined the North Somerset Yeomanry as a part-time soldier in what was to become the Territorial Army. He rose to become a sergeant and, in August 1914, was mobilised with the rest of his unit. He arrived in France on 3 November 1914 and marched on to Ypres in Flanders. He reached there on 13 November towards the end of the First Battle of Ypres. On only his fifth day on Flanders, 17 November 1914, he was killed during fighting around Zwarteleen, south of Ypres (not 17 February 1915 mentioned above). He was initially reported as wounded or missing, and his death was not confirmed for more than a year. Alf was mentioned in the list of names following Field Marshall French’s despatch of 20 November 1914 for ‘gallant and distinguished service in the field’. His grave was subsequently lost or destroyed in four more years of fighting at Ypres and he is one of the 55,000 missing men commemorated on the Menin Gate there. 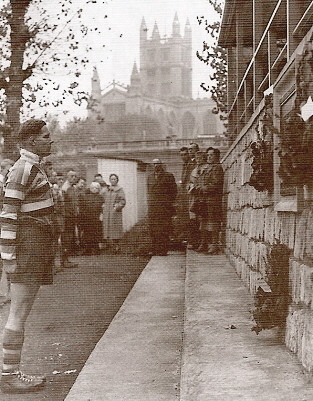 I’d be very interested in learning more about Alf’s time with Bath RFC if anyone wishes to contact me. William Curtis played scrumhalf for Bath between 1902 and 1907. He features in the 1913 Bath Team V Old Crocks photograph on this site. He was a gas fitter living at Twerton when he was called up to serve as Private 32166 in the 1st Somerset Light Infantry in 1916. Sadly he was killed on 14 April 1918 and is on the Ploegsteert Memorial. He was 37 years old and left a wife and two children. Thank you Ian. I have updated the website . Was William known as Bill? Wherever possible we like to personalise details. Do you know whether he was born in Bath?